Almost a month ago, on May the 19th and on the 20th, it was celebrating the first international stick dance festival in the villages of Eibar (Gipuzkoa) and Pamplona (Nafarroa). There were many dance groups invited to this festival. One the one hand, there were plenty groups from the Basque Country and on the other hand we had the chance to see the performances of some international stick dance groups from Catalonia and from Spain. Besides, there were other groups like “Pauliteiros de Miranda do Douro”, from Portugal and the Morris dancers of “The Britannia Coco-nut Dancers of Bacup, from England. This festival was co-organised by the dance groups of “Duguna dantza taldea” of Pamplona and “Kezka dantza taldea” of Eibar. 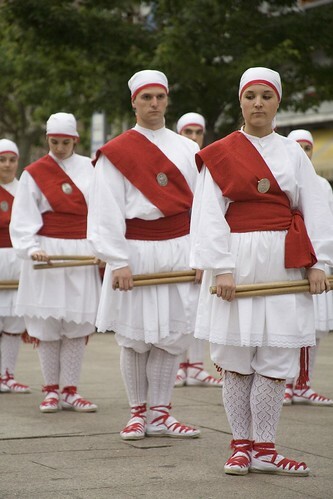 This entry was posted in basque, dance, dancing, eibar, folk, pamplona, stick-dance, traditional. Bookmark the permalink.